There are many factors that contribute to treatment success when it comes to addiction: program quality, financial resources, complicating mental health factors, and so on. However, there is one factor that remains a relatively untapped resource given the dramatic impact it can have with regard to improving treatment outcomes, and that is family involvement. Granted, family programming is a standard part of most addiction treatment programs today, and many of these programs are doing excellent work in this area. However, there is more that can be done with regard to the role the family can play in providing effective support for their loved one. Improvement in this area has direct implications for lowering the high recidivism rates currently seen in the addiction treatment industry. Treatment "success" is the obvious hope for anyone with a loved one being treated for an addiction problem. However, family members would be well advised to regard treatment success as an interactive process in which the family has much more to do with the outcome than is generally realized. The earlier they learn this in the treatment process, the sooner they can begin efforts that ultimately improve the chances for a positive outcome. "No Mrs. Johnson, our regular teacher doesn't make us do that." The family isn't in treatment with their loved one, and clients don't always provide their families with full or accurate details of the directions they receive for establishing successful recovery. When clients don't follow though with treatment recommendations, subsequent failure might be regarded as "user error." Proper treatment was provided, yet the consumer didn't use it correctly. However, the more the family understands what the client is supposed to be learning, i.e becoming an "educated consumer", the less vulnerable they are to becoming complicit in supporting user error. Even if the client fails to utilize treatment services effectively, the family is better equipped to maintain effective support and accountability, thus keeping the chances for treatment success alive. This is a critical point where much treatment failure can be avoided. For example, here is a short video that illustrates how I introduce parents to addressing an addiction problem with a child. In less than five minutes, it provides a clear description of what's going on in an addictive family system and motivates parents to begin taking action to address the problem in a healthy manner. Improving the extent of family education is one of most important areas to explore in our efforts to improve treatment outcomes. To the contrary, one of the greatest travesties that occurs in the treatment industry today is when tens of thousands of dollars are spent on treatment and it all goes out the window as soon as the client is discharged because recommendations are not followed. A great deal of this can be avoided by working harder to help the families learn what they can do to provide treatment accountability. "Why do I have to go to all of these meetings? I'm not the one with the problem!" Treatment professionals recognize that addiction impacts the entire family system and should be treated accordingly. Unfortunately, another major contributor to treatment failure has its roots in the tendency for the family to hold the client in same role they held prior to treatment and unwittingly pull them back into their old behavior while disregarding the need to establish their own recovery. Despite their statements of hope for treatment success, they actually create a set-up for the client to fail. If there's one thing I've learned in working with families of treatment clients, it's the need to develop effective strategies for helping them over the hump of really "getting it" when it comes to family recovery. 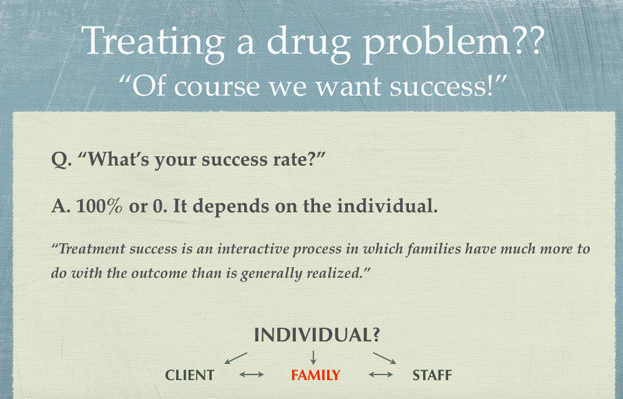 In summary, nobody said addiction treatment was easy, and there are many factors that influence treatment outcomes. The role the family plays in the client's treatment can often become the x-factor for determining success or failure. Being more diligent about efforts to educate the family from the outset and providing effective strategies for increased family participation creates the potential for dramatic improvement in treatment results.